Your endodontist can be a valuable member of your restorative team. You can rely on your endodontist to support and reinforce your appropriate treatment plan. Everyone knows that successful endodontic therapy requires proper coronal restoration. 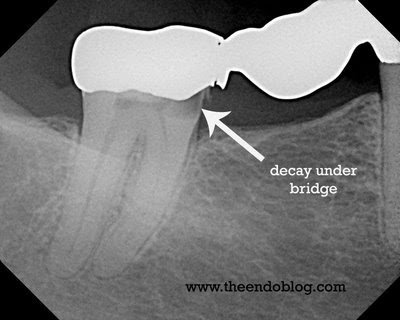 Without adequate restoration, even the best endodontic therapy will fail. As endodontists, we are invested in the successful treatment of the tooth, therefore, we will always encourage the patients to have their endodontically treated teeth properly restored. That means uncrowned posterior teeth and teeth with large restorations getting coronal coverage to protect them from cracks and fractures and current crowns/bridges with leaking margins/decay replaced to prevent coronal leakage. When a patient leaves my office, I make sure to let them know that they need to protect the root canal against bacterial leakage and occlusal forces. If our patients have been educated correctly, they will return to your office and ask for their new crown or bridge. This patient came into my office today hoping for a root canal and a filling to preserve this bridge. I encouraged the patient to place a new bridge to prevent coronal leakage following endodontic treatment. 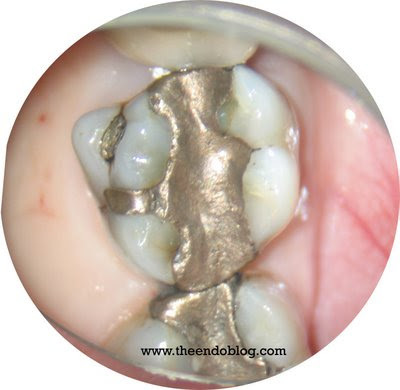 I frequently see uncrowned posterior teeth with large restorations, craze lines & cracks. These teeth, especially in patients who are bruxers or have severe patterns of occlusal wear, are at risk of splitting the tooth. I encourage them to talk to their dentist about crowns to protect those teeth before they are damaged and become non-restorable. I hate to tell patients that they need an extraction because the tooth has split in half. 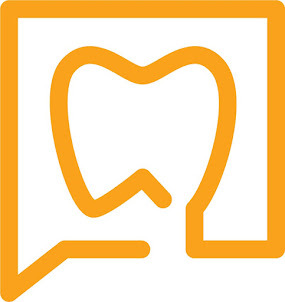 The general dentist has the primary responsibility for treatment planning. Your endodontist can play an important part of your restorative team by helping to educate your patients on the importance of proper restoration following endodontic treatment and the importance of proper restoration to prevent cracks/fractures. Cosmetic Dentist Union CityEndodontists are indeed very important in the dental field. With them around, you will definitely have safe restorations as they save your teeth through restorative or root canal treatment. I try to encourage my patients to save their natural dentition through root canal treatment and proper crown restoration. There is no substitute for natural teeth.